NEW YORK -Federal Reserve Chair Janet Yellen said Tuesday that the Fed still envisions a gradual pace of interest rate increases in light of global pressures that could weigh on the U.S. economy. Yellen did not specify a timetable for further hikes to follow the Fed's rate increase in December from record lows. She said the risks to the United States remain limited but cautions that that assessment is subject to "considerable uncertainty." In prepared remarks to the Economic Club of New York, the Fed chair said the central bank is monitoring the effects of a global economic slump, lower oil prices and stock market turbulence. 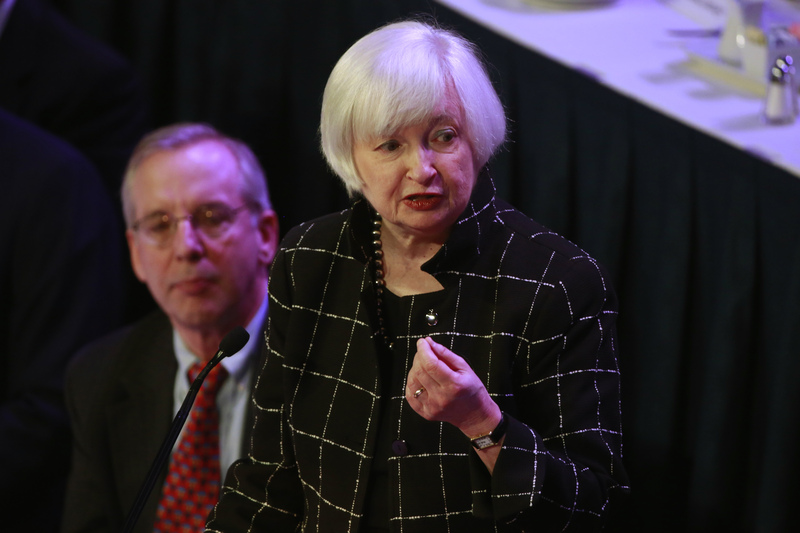 She said that given the risks, the Fed will "proceed cautiously" in raising rates. Most economists expect no hike at the Fed's next policy meeting, to be held April 26-27. Yellen's remarks "were predictably dovish," Paul Ashworth, chief U.S. economist with Capital Economics, said in a note. "In particular she is worried about how smoothly China's shift from investment-driven to consumption-driven growth will proceed." Yellen's remarks on the Fed's economic outlook and interest rate policy have been highly anticipated by investors trying to divine the timing of the next rate increase. When the Fed met two weeks ago, it kept its key rate unchanged and signaled the likelihood of just two rate increases this year. That was half the number that Fed officials had envisioned in December, when they raised their benchmark rate from record lows - their first hike in nearly a decade. As a result, most economists concluded that no rate increase would likely occur before June. But comments last week from several of the Fed's regional bank presidents had raised the possibility that the central bank will decide to raise rates in April. One of them, Dennis Lockhart of the Fed's Atlanta regional bank, said in a speech that he thought the strength of the most recent U.S. economic data could justify a rate increase as early as April. The views expressed by Lockhart, who is viewed as a centrist in his approach to interest rates, was echoed by some other Fed regional bank presidents. Lockhart suggested that despite global economic weakness, the U.S. job market is nearing full health - a key condition for a rate increase. He also said he thought that inflation, which has remained persistently below the Fed's 2 percent target rate for nearly four years, would likely begin picking up later in the year. The message from Lockhart and some other regional bank presidents seemed to depart from the signal sent by the statement the Fed issued March 16 and by the news conference Yellen held afterward. The theme then was of a slower pace of rate increases in light of global pressures that risk slowing the U.S. economy. In a speech in Singapore on Tuesday, John Williams, president of the Fed's San Francisco regional bank, said his outlook for both the U.S. and the global economies remains largely unchanged over the past few months. He said the Fed has made it "abundantly clear" in its communications that it expects to raise rates gradually. "We took the first small step with a modest rate hike in December, and the future will be, as we've said repeatedly, gradual and thoughtful," said Williams, who had suggested last week that a rate hike in either April or June was possible. Ashworth said the tenor of Yellen's speech today is likely to tamp down speculation that the Fed could hike rates next month. Whatever decision the Fed does make in April will hinge on its view of the economy's durability. In the past week, some reports have produced weaker-than-expected readings, including a sharp drop in orders for long-lasting manufactured goods and tepid consumer spending. Those reports have led some economists to downgrade their forecasts for growth in the current January-March quarter from a 2 percent annual rate to a lackluster 1 percent. The consumer spending report also showed that the Fed's preferred inflation gauge is still signaling that inflation remains well below its target level. For the 12 months that ended in February, inflation rose just 1 percent. "Core" inflation, which excludes the volatile items of food and energy, increased 1.7 percent. Because of the subpar inflation and the weakness in consumer spending, which drives about 70 percent of economic activity, many economists still say the Fed will be cautious about raising rates. "The numbers show that inflation is nowhere to be found, and consumers at the moment are on strike," said Sung Won Sohn, an economics professor at California State University, Channel Islands. "They don't want to spend money because of uncertainty in the economy, including the recent volatility in the stock market." Sohn said he thought the economic outlook remained too uncertain to justify any rate hikes at all this year. "I don't think either the global economy or the U.S. economy are on a sound track at the moment," he said.